Russell joined Wests Ashfield in 1967 and is a Life Member and a Director since 1991. He Chairs the Audit & Risk Committee. Russell’s background is in Information Technology, Risk Management and business continuity planning. He served 30 years with Qantas and was involved in major organisational changes in IT, after which he became an adviser to local and international corporations. His experience as a Director dates from the 1960s and ranges from family businesses to international joint ventures, including AT&T Asia Pacific. He was a Director of Wests Sports Club for 15 years, Wests Magpies for 3½ years, the Ashfield (Inner West) LGA ClubGRANTS Committee for 17 years and Chair for 6 years and was a founding Director of Wests Tigers until 2006. Russell’s focus now is on advancement of governance issues, Enterprise-wide Risk Management and sound strategic expansion of Wests Ashfield’s facilities and community engagement initiatives. He also contributes to activities that celebrate our proud past and exciting future. 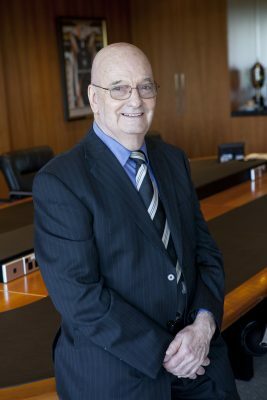 Russell was elected a Fellow of the Australian Institute of Company Directors in 2003.